The CapeFLYER is a unique seasonal, weekend only train line that operates along a 78 Mile Route from South Station, Boston to Hyannis on Cape Cod entering service on May 18, 2013. The train is operated by (although the Conductors ware unique CapeFLYER Polo-Shirts for their uniforms) MBTA Commuter Rail under contract and managed by the Cape Cod Regional Transportation Authority (CCRTA) and priced to have train fares cover all operating expenses. The route is only operated Tri-Weekly over the weekend between Memorial Day and Labor Day. On both Saturdays & Sundays the train train leaves Boston in the morning and returns in the evening, allowing day trips to the Cape. Friday evenings is a single round-trip. The departure to the Cape is combined with the 5:12 Middleborough/Lakeview Commuter Rail Rush Hour trip from South Station and makes additional stops at all Middleborough/Lakeview stops (although stopping at Quincy Center instead of Braintree) before continuing out to Hyannis. The trainset returns to Boston in CapeFLYER only revenue service that night (leaving at 8:30). At both Hyannis and Buzzards Bay connecting CCRTA Bus Service plus Plymouth & Brockton Intercity Buses in Hyannis provide connecting service to nearly everywhere in Cape Cod. There is also dedicated shuttle service to connect the ferries to Martha's Vineyard and Nantucket. The CapeFLYER uses a normal MBTA Commuter Rail trainset (that would normally just be sitting a train yard over the weekend) all with high-density 3 by 2 seating that operates in a Pull-Pull Configuration with a locomotive at each end. The train operates with a mixture of single-level and Bi-Level Cars but always includes (as the first car of the train) specially rebuilt BTC-1C #224. This car is the CapeFLYER Car and the exterior includes a beach themed wrap (luckily not over the windows) with ads below the windows, the logos of the CapeFLYER and the text Summer Weekend train Boston to Cape Cod above the windows. The inside is special as well with only about ten rows of regular seats. One end of the car is dedicated to Bike Racks (a similar car with bike racks also operates on summer weekends on the Rockport Line). 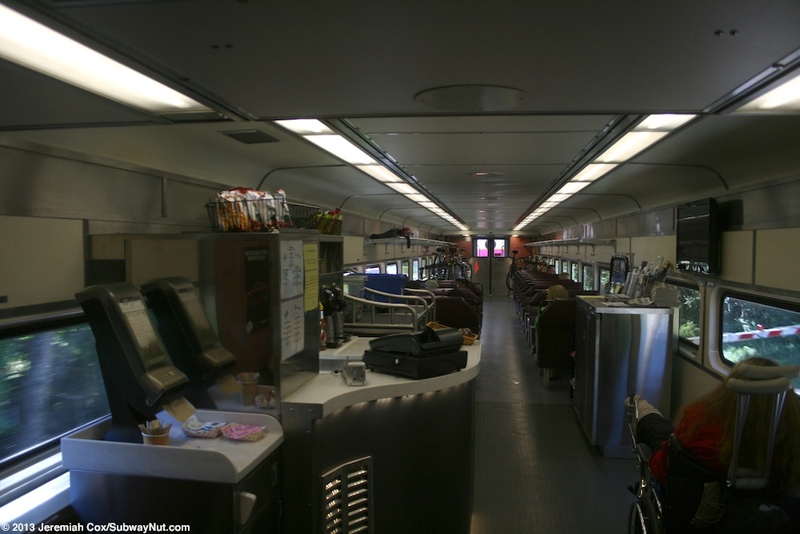 is the CapeFlyer Concession counter, and also brochure rack. The Concession could definitely use some improvement. There isn't a microwave for hot food, just a couple of coffee makers for coffee. Muffins were the only real breakfast option and they looked saran wrapped and unappetizing. The Concession has a decent beer and bar selection. The CapeFLYER trains are all unreserved and tickets are only sold as one-ways or round-trips (offering a $5 savings over purchasing two one-way tickets, the return must only be taken during the same year) with no senior or disabled disconuts, bikes are carried free of charge in the bike car. With cash from the conductors on-board the train receiving a paper ticket punched like all MBTA on board tickets (no on-board surcharges). With cash or cards at the MBTA Commuter Rail Ticket Office at South Station: These tickets come on pre-printed pads (for either South Station - Buzzards Bay, or South Station - Hyannis) that the ticket agent rips individual tickets off of to sell and look like an event ticket with ads on the back for Cape Cod services. They are only available at South Station, other MBTA ticket offices (like at North Station, your webmaster was there before his CapeFlyer trip and asked) don't sell them. With cards using MBTA mTickets, these are paperless, purchased and used using the MBTA mTicket — Mobile Ticketing App (that also covers all Commuter Rail and Ferry trips) requiring an iPhone, or Android Phone. The two CapeFlyer destinations are listed as Fare Zones F1 for Buzzards Bay and F2 for Hyannis in the app. The Cape Flyer began operations on May 18, 2013, a week before Memorial Day, it was originally scheduled to run only until Labor Day 2013 but decent ridership has led to an extension of service until Columbus Day 2013 (announced on August 11), and a resumption of operations for Summer 2014 are expected. The line is the first time train service has operated to and from the Cape since the discontinuation of Amtrak's seasonal Cape Codder after the 1996 season. The last trains to operate over the current route of the CapeFLYER via the Old Colony Lines (although they terminated at Braintree for MBTA Red Line Connections into Boston, Commuter Rail service wasn't restored on the Old Colony Lines until 1997) were between 1984 and 1988. For a complete history see the Hyannis Station Page.